Since you’re reading this post, you may already be familiar with tf*idf (at least to some extent). There are plenty of well informed articles, and even some seo tools, out there that are worth your attention. But what’s more is the research, and the math – and I think understanding how these fit together is worthy of a new post. There are a lot of folks much smarter than myself building natural language processing engines at a much higher level than I’m capable of; but that’s not what I’m here to talk to you about. Instead I want to show you what we’ve built and how we’re using it. If you just want to go grab some tf*idf data and not muck about reading the rest of this post, you can go ahead and do that clicking the button below. The current version is built to support English only, but we have plans to add other languages in the future. *Please Note: This tool is getting hit pretty hard, so if you get an empty results graph, it means we need to adjust some settings. Please shoot me a tweet and let me know. Thank you kindly. 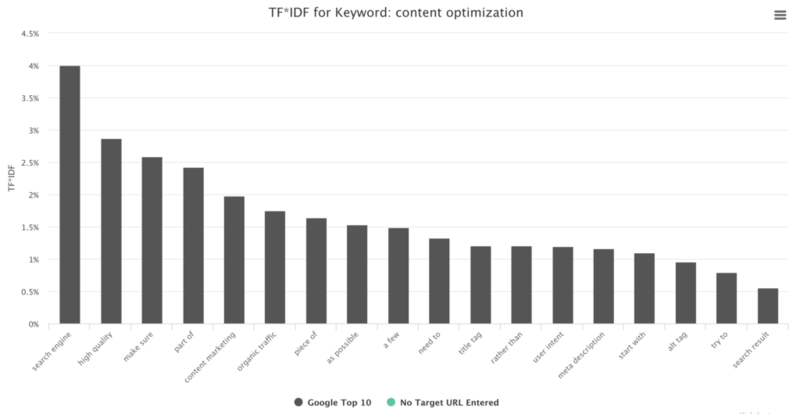 But this post isn’t just to show off a beta demo of our shiny new tool, but instead to hopefully start a conversation around optimizing content for SEO by focusing on topic relevance. Crazy as it may seem, I’ve found that topic modeling and optimizing content to speak to specific concepts holds more sway with Google these days than even URL and information architecture in some respects. I know I know, it’s heresy coming from me who has long preached the importance of IA as the foundation for any high performance website, but Google’s approach to ranking pages based on topical relevance and intent has changed. The libraries out there for tf*idf, semantic NLP, and even Word2Vec are not new at this point (though still pretty cutting edge when it comes to being put into practice from an SEO perspective). And most (if not all) of these beautiful database driven libraries that are not only accessible but freely available for us to use, process, and build upon. So What’s a Technical SEO To Do? 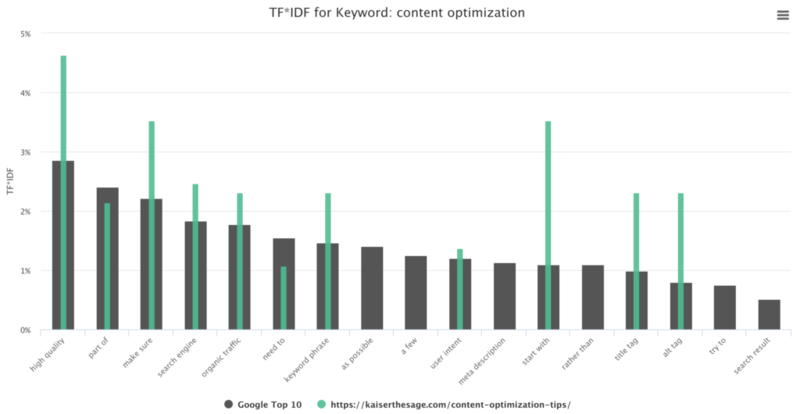 We’ve built a tool that analyzes the term population and frequency of the top 20 organic ranking URL’s in Google, spitting out the tf*idf calculation for each term and then (if you so choose) scores them against your target URL and/or sample of content from your document for your specific input keyword. The purpose of this is to see how your current content is using the terms that are being used by the pages Google has deemed worthy of a top ranking for the same target keyword; what are the topics and concepts being represented and how often are these terms appearing (or not appearing) in the overall document population. From here you can adjust your content to include more of the terms Google may be expecting to see in the frequency that Google is expecting to see them. If you haven’t yet built the page or created the content, that’s fine too. Just don’t set a target URL and instead run the report for a keyword to see what topics you should be addressing in your content. Tf*idf stands for term frequency times inverse document frequency. Tf*idf is a numerical statistic used in information retrieval to represent how important a specific word or phrase is to a given document. The tf-idf value increases proportionally to the number of times a word appears in the document, but is often offset by the frequency of the word in the corpus, which helps to adjust for the fact that some words appear more frequently in general. Tf*idf is most often used as part of latent semantic indexing (or LSI), which is a technique for processing language (also often referred to as natural language processing, or NLP) and allows for systems to rank documents based on relevance against a specific term or topic. The goal of this approach is to make sense of a population of unstructured content to score what it’s about and how strongly it represents that topic or concept versus other documents in the sample population. The purpose of which is to allow machines to understand what pages are about. LSI came about as a solution path to work around the 2 most challenging constraints of using boolean logic for keyword queries; multiple words that have similar meanings (synonymy) and words that have more than one meaning (polysemy). Consider a document containing 100 words wherein the word SEO appears 3 times. The term frequency (i.e., tf) for SEO is then (3 / 100) = 0.03. Now, assume we have 10 million documents and the word SEO appears in one thousand of these. Then, the inverse document frequency (i.e., idf) is calculated as log(10,000,000 / 1,000) = 4. Thus, the Tf-idf weight is the product of these quantities: 0.03 * 4 = 0.12. An N-Gram is a set of co-occurring words within a given population of text. These are computed as part of analyzing the topics contained within a document by typically moving one word forward, though you can move X words forward when applying calculations to more complex data sets. For the purposes of calculating tf*idf, terms are usually calculated as unigrams (one word terms), bigrams (2 word terms), or trigrams (you guessed it, 3 word terms). So it reduces the total n-grams to 7, if N=3. When it comes to computationally processing for natural language (especially for SEO), topics seem to be best represented by bigrams and trigrams, so it’s important to understand the distinction. An over-simplified answer is that these toolsets are literally the building blocks of search engines and how Google is scoring and associating your pages with keywords related to the document’s content. Another way to think about this is Google has billions of pages to crawl and score for relevance on topics that surround a user’s submitted query. In order to return results Google needs to rank these documents based on relevance. Not all of the documents will contain all of the terms relevant to the query, and some terms are more important than others. The relevance score of the document, at least in part, on the weight of each term that appears in the document. What Do The Results Look Like? So while running these types of calculations is actually pretty straightforward, it’s not really as simple as just adding and dividing up a bunch of term and word counts. Instead it’s best to lean on some of the open source libraries (like this one written in Python) and hook these up to some HTML crawlers to process this data for you more accurately. You’ll want to run a target URL for a target keyword AND, more so, in order to actually analyze the results against something to make sense of them, you’ll need a population to run your URL against. We use the top 20 organic ranking pages on Google for the target keyword, and then scrape all the HTML on those pages, strip out the header, footer, nav, and common stop words, and then calculate the tf*idf on the remaining document corpus. As you can see the approximate term frequency for content marketing across Google’s current top 20 ranking URL’s for content optimization, is 1.97%. From which we’re able to highlight specific terms appearing at varying weights throughout the term population between the 2 document sets, to start to identify where there are variances between your target URL and the term frequency among the top 20 ranking pages. So in the KaiserTheSage.com article, you can immediately see that they’re using the terms high quality, search engine, organic traffic, keyword phrase, start with, title tag, and alt tag more than the average across the other top ranking URL’s (but not by much). It’s also worth noting how representative Kaiser’s (Jason Acidre’s) post is of the most used bigram phrases across the top 20 ranking post corpus. *Please Note: you will notice some variance between the 2 data runs; the first without a target URL and the second above with a target URL. This is due to bigram normalization between the 2 corpus sets with and without the target URL. Our tool in it’s current form doesn’t do this, but this is exactly what we’re working on – so it’s coming. 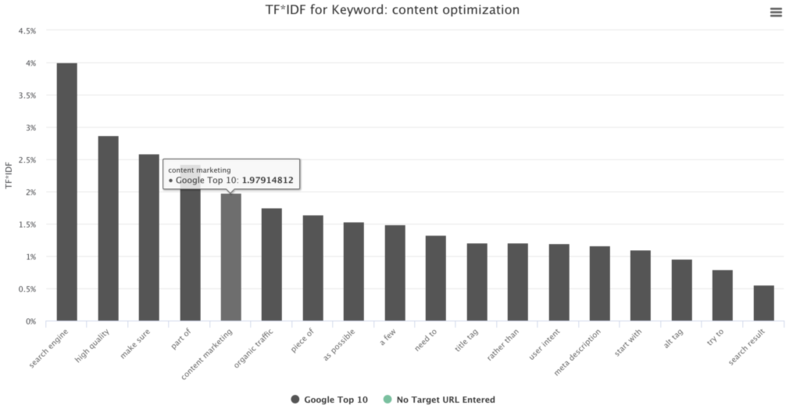 However, if you do want to at least grab the tf*idf weights for a target keyword and target URL to see how they stack up against the current top 10 ranking URL’s on Google for that keyword – click the button below. From here you can make an effort to adjust your content/page to better represent the terms and corresponding frequencies appearing across the current ranking URL’s, to do a better job of presenting the content and topics that Google is currently rewarding. Nick is the Founder and CEO of From The Future. When he's not elbow deep in data, he's spending time with his wife, his dogs, or his cars. Great Introduction to the topic Nick. Although I already knew about TD IDF’s importance, I never knew how it worked. All i used to do is use the content optimization tool at ryte.com and optimize my content. Looking forward to your tool! Nice post, thanks. I suspect that mister G. uses Tf-Idf as input model for more complex models, such as LDA, that consider the pages to be composed of a mixture of different topics. Anyway learning how Tf-Idf works is definitely worth it! Hey Gianca – I think G has moved far past tf*idf at this point, but it was likely part of the original building blocks for NLP that has since progressed to LDA and more machine learning based approaches for parsing and scoring regular language. Nick great article. Which tool do you think is best to get this data? Unfortunately the tool came back with empty results; should we try later? Is there a way to target a different Google TTLD? Yes I talk about this happening in the actual post… to be clear though; it’s only built for U.S.-based English right now. If you try to run for another country/language it won’t work. It’s been a while since I understood less in a technical SEO post…. Such an interesting topic though. You mentioned on your twitter about speaking events. If you’re ever in the UK Cardiff SEO Meet is a tiny SEO event that’s been running for a year or so and some good tech start-ups down here too that you might like a coffee with. Hi I tried it and provided a single keyword and url but I am getting blank chart. It seems very interesting. Can not wait to use this tool. INCREASING CONVERSIONS WITH "KEYWORD INTENT"
Our data driven approach to keyword research.